PITTSBURGH (CelebrityAccess MediaWire) — The Pittsburgh Penguins new arena is taking shape. 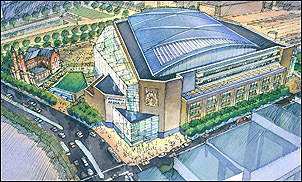 The team just signed off on plans worked up by HOK Sports for a new 18,500 seat facility in Pittsburgh, expected to be ready by 2010. In addition to the rink, the $290 million arena will feature space for events, retail shops and parking facilities as well as provisions for a possible hotel. According to the CP, the team's CEO Ken Sawyer has submitted the plans to the city planning commission for review and approval with an eye for final approval by January 2008.